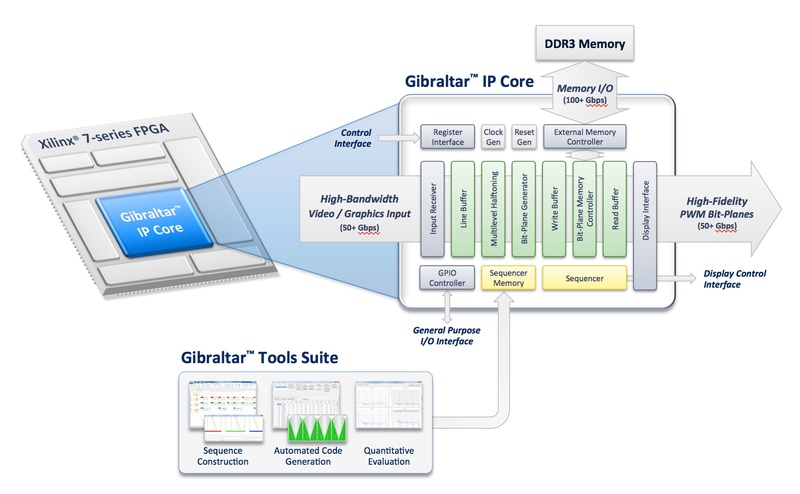 Gibraltar™ is a high-bandwidth firmware processing architecture that performs real-time conversion of video data into digitally accurate, gray-scale weighted and multi-toned bit-planes for PWM-based display technologies. The Gibraltar™ Processing architecture is designed to provide bottleneck-free processing, even when paired with the world's fastest display technologies. 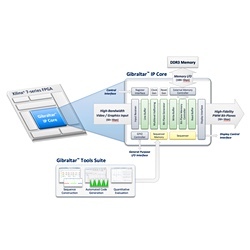 When synthesized in modern programmable devices, such as a Xilinx Kintex®-7 and UltraScale™ FPGAs, Gibraltar™ comfortably supports sustained processing throughput in excess of 50 Gbps. Modular firmware design supports a broad range of target display resolutions and system configurations, such as sequential color single-chip or single color per channel three-chip. A flexible input interface allows rapid integration in existing hardware / firmware designs. Gibraltar™ converts video data into bit planes using programmed instructions provided in the form of a “sequence” binary. Companion development tools are used to design and compile sequences as well as generate multilevel halftoning tables tuned for the target display technology. Powerful features of the Gibraltar™ Tools Suite include the automated selection of bit plane codes that are optimized to suppress artifacts associated with PWM-based displays, such as dynamic false-contours, dark noise dither and sequential color break-up, as well as quantitative evaluation of the resulting performance of each sequence design using metrics accurately calibrated to the human visual system. The end results are sequences with remarkable fidelity, accuracy and minimal display artifacts. The Gibraltar™ Processing architecture is tailored for each application by Brass Roots Technologies and licensed as a custom IP Core in the form of encrypted VHDL ready for FPGA firmware integration. Custom sequences are also developed for each licensee upon request. Please use the form on this page to Contact Us for more information. The native 1920 x 1080 DMD in this example has a minimum load time of 43.2 us, which equates to a peak data rate of 23,148 binary fps or 51.2 Gbps. The DDR3 external memory interface is 64-bit @ 933 MHz DDR, which translates into peak memory I/O bandwidth of 119.4 Gbps. Conservative de-rating for overhead leaves a sustained memory I/O bandwidth of 101.2 Gbps. Subtracting the peak data rate of the display device (101.2 Gbps minus 51.2 Gbps) leaves a remaining memory I/O bandwidth budget of 50.0 Gbps. This means that after allocating enough bandwidth to continuously drive the 1080p DMD at it's peak data rate, the Gibraltar™ IP core has up to 50 Gbps sustained input bandwidth available for video pixel processing. High Frame Rate / Low Latency: Standard Full HD video at 60 Hz frame rate requires 16.67 ms to display each frame. Some applications, however, require much higher frame rate to achieve improved motion rendition (i.e. less motion “blur” or “smearing”) or to display left eye / right eye images for 3D. In other cases, such as interactive “man in the loop” applications, low display latency is a critical concern. For an advanced application, let's say the goal is to process and display 10-bit Full HD video at a blistering 1,500+ fps, which equates to an input data rate of 93.3 Gbps (ignoring video blanking). At first glance this may seem impossible since we have only 50 Gbps of available video processing bandwidth. In fact it is entirely possible, and this example readily illustrates the importance of the advanced floating point Multilevel Halftoning module. Whereas Gibraltar™ Processing up-converts the number of displayed bit planes to maximize the display fidelity at relatively low display frame rate, in this case the Multilevel Halftoning module will down-convert the number of displayed bit planes per pixel in order to support higher display frame rates within the limits of the available bandwidth. To meet the 1,500 fps target in this example, the Gibraltar™ IP core is configured for 12 pixels of input data per pixel clock ≈ 3.6 x 109 pixels per second and 15 bit planes per pixel. In this configuration, the Gibrlaltar™ processor can output Full HD resolution frames at a sustained rate of 1,540 fps / 649 us display time. In a sequential color system (e.g. 1-chip) the Gibraltar™ IP core would run a sequence that optimally distributes the bit planes across all three colors over the frame display time; conversely, in a single color per channel system (e.g. 3-chip) each channel would enjoy all 15 bit planes per frame for greater fidelity. Multiple Video Inputs and/or Component Channels: In advanced auto-stereo 3D applications, it's often required to display multiple views per frame. Other specialized applications, such as simulation environments, often need to display both visible and infrared information in the same frame and therefore need to process more component channels per frame than standard 3-color RGB. For example, let's say the application requirement is to simultaneously process and display 16 Full HD video inputs in a single 60 Hz frame time. In this case, the Gibraltar™ IP core is configured to process 8 pixels per clock and 21 bit planes per pixel, and each input will be displayed in 1.04 ms (equivalent to 960 Hz). Alternatively, the Gibraltar™ IP core can process an input of 1920 x 1080 @ 120 Hz and 8 independent component channels into 16 bit planes per component channel and displayed in a 8.33 ms frame time. Combination - Multiple Simultaneous Inputs at High Frame Rate: What if the requirement for an advanced application is to process two independent 1920 x 1080 RGB inputs @ 360 Hz each? In this case, each input must be displayed in 1.38 ms, equivalent to 720 fps. The best use of the available processing bandwidth configures the Gibraltar™ IP core for 6 input pixels per clock and process the inputs at up to 32 bit planes per pixel. The above examples demonstrate the extreme performance and versatility of the Gibraltar™ Processing architecture for specialized display applications. Please use the form on this page to Contact Us for more information. Please use the form on this page to Contact Us for more information. We respond to web inquiries within two (2) business days.